Synopsis: A young naive woman falls for a handsome young man who her emotionally abusive father suspects is a fortune hunter. Did You Know? So unhappy was he with his performance, Montgomery Clift walked out in the middle of the premiere. Quotables: CATHERINE: My father wouldn’t abuse you; he doesn’t know you well enough! 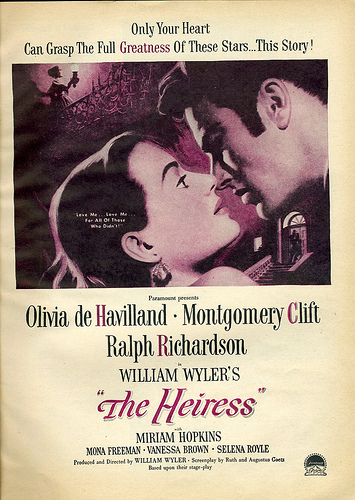 Olivia de Havilland is wonderful as the timid and self-conscious young heiress. Her father purports to have her best interests at heart, but he never fails to express his disappointment that she is neither as perfectly proper nor beautiful as her mother, either with direct insults or backhanded compliments. She’s tried so hard to meet his expectations and the expectations of everyone else. Just when everything seems to be coming up Catherine, it all fall apart. And that’s the last straw for Catherine, she becomes hardened to her father’s controlling insults, and is no longer the mousy girl she once was. De Havilland makes the transition of character with grace and ease, and there should be no doubt that she deserved that Oscar.